After some wacky June weather, it looks like summer is finally coming to Chicago later this week (hello 80 degree temps!). And boy, can it get hot around here during a typical summer. When the weather makes outdoor play impossible, I've been very grateful to have access to so many local indoor play spots where my kids can run around and expend all of that summer energy (ideally while I enjoy coffee and a muffin). 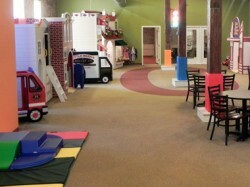 Here are some of our favorite destinations for indoor play. Note that many of these businesses get very crowded when the weather is inclement so definitely visit the respective websites to learn more about admission procedures. Little Beans Cafe. My kids absolutely love it here. We pass by it nearly every day and one of them always asks if we can stop in to play. We especially love their newly-opened outdoor patio and ice cream shop (delish). Kookaburra Play Cafe. This newcomer is another fun and convenient indoor play option. The decor and play equipment has a stylish, minimalist look that contributes to the great vibe in this space. Pickle's Playroom. We are also big fans of this Lincoln Square coffee/play space. But this play spaces features a twist! Kids can also get their haircut here (again, such a genius idea to offer haircuts while the other kiddos play -- and mom can also grab a coffee). Be sure to check out the wall-mounted airplane that kids can operate from the control tower. Super cute. Explore and Much More. Although they don't have a cafe component, this business located in the Southport Corridor has lots of offer kids of all ages. Although it looks small from the outside, the space is actually quite big with varied offerings for everyone from babies up to age 10. The focus here is on educational activities (with some fun gross motor opportunities like a climbing wall added in). Plus, it is ridiculously clean (always a plus). Where do you like to play when it is hot, hot, hot outside?